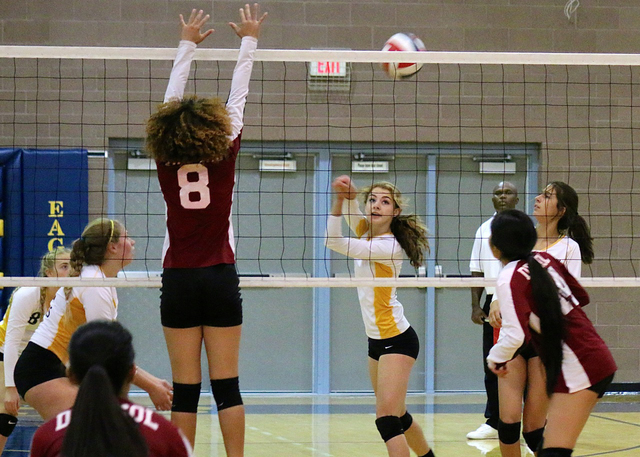 The Boulder City High School girls volleyball program continued its early league dominance, defeating Southeast Career Technical Academy on Sept. 22 and Del Sol on Monday. Laura Hubel/Boulder City Review Boulder City High School senior Kenadee Bailey, center, was instrumental in the Lady Eagles' victory over Del Sol on Monday. The girls swept all three sets, winning 25-19, 25-9 and 25-12. Sweeping their way through the Roadrunners (25-9, 25-10, 25-19) and the Dragons (25-19, 25-9, 25-12), the Lady Eagles have now broken past .500 with a 12-11 record on the season, including a recent 3-0 league stretch. Dominating the Roadrunners early, the Lady Eagles exploded out of the gate on offense, totaling 36 kills as a team, led by junior captain Maggie Roe, who accumulated 17 on the day. Also tallying nine digs and a block and serving ace apiece, Roe was joined by junior Jerra Hinson and senior Kenadee Bailey in the Lady Eagles’ scoring efforts, with both providing six and three kills each. Hinson finished her outing against the Roadrunners garnering a block, while Bailey continued to provide an all-around effort with three blocks and serving aces, along with eight digs. Mentioning passing, senior captain Alea Lehr also had a strong performance against the Roadrunners, garnering 31 assists and then another 31 against the Dragons to bring her season total to 493, which ranks her first in the state, according to Maxpreps. Roe had 15 kills and three serving aces against the Dragons, while Bailey had four serving aces, four assists and three blocks and senior Lexi Bringle had 11 digs and five serving aces. Finally clicking at the right time, the Lady Eagles seem to have righted their ship this season, playing their best ball in every facet of the game. With a road matchup against Chaparral on Wednesday, there will be no better test to see if they can regain their title in the Sunrise 3A class after winning four consecutive league titles from 2011 to 2014 before finishing second to Virgin Valley last season. Results of Wednesday’s game were too late to be included in this week’s edition.